Today was hot, humid and horrible – the perfect weather to forgo cooking of any kind and eat healthified ice cream instead. With a lot of fruit, a little yogurt, and a dash of cream, it’s the nutritional equivalent of fruit salad. But it’s the taste equivalent of a creamy fruit gelato, and it takes just two minutes to make – which is faster than I’ve ever managed to make fruit salad. 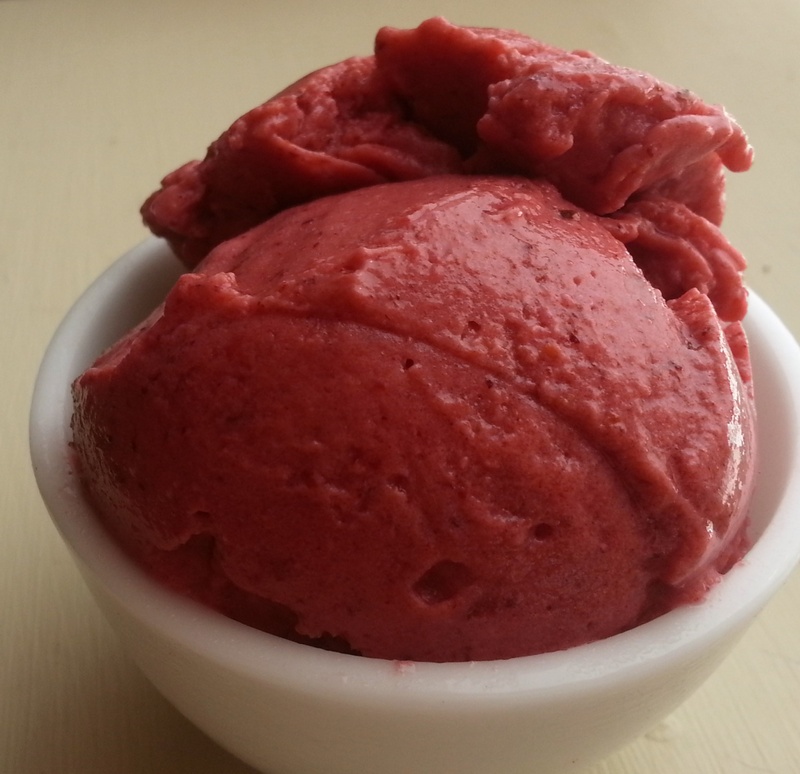 For this sherbet, I used equal parts wild juneberries, strawberries, and pear sauce. Juneberries have small, almond-flavored seeds that add a nice texture to this smooth dessert. If you don’t have access to juneberries (also sold commercially as saskatoons or serviceberries), you can substitute blueberries, pitted cherries, or a mix of the two. You can also play with the proportions, but keep juneberries or blueberries to one-third or less of the total volume. If you use more than that, the sherbet can get a gelatinous texture that I don’t find appealing (although your milage may vary). Pear sauce and applesauce do equally well in this recipe. Pear sauce generally imparts a subtler flavor when mixed with other fruits, and apple gives a slightly tarter, zippier kick. I keep frozen cubes of each on hand all summer for instant ice creams. Take a jar of pear sauce or applesauce and pour it into an ice cube tray. Freeze. Scrape from the blender when it’s about the consistency of soft-serve. I use an ice cream scoop to make it pretty. If you want a firmer ice cream, stick your ice cream scoops in the freezer for a few minutes before serving.